FC Shakhtar Donetsk President Rinat Akhmetov has announced the signing of a new two-year contract with the club's head coach, Portuguese Paulo Fonseca. "Do you remember how, two years ago, we invited Paulo to Shakhtar and everyone shouted: 'What will happen, what's going to happen to Shakhtar now?! Now everything will go wrong with Shakhtar. Everything's wrong, there will be problems. We don't know what to expect.' And what do we see? Two league titles, two Cups, one Super Cup and a brilliant Champions League campaign. This indicates that Shakhtar made the right decision two years ago by inviting Paulo and his assistants to the team," the club's official website quoted Akhmetov as saying. "Now we've signed a new contract, and I'm confident that new successes await us in the future. Paulo is a professional. He's an ambitious man. An industrious man. And he's got great ideas. 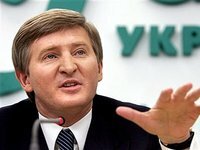 He knows what to do," Akhmetov said. Fonseca took charge of Shakhtar at the end of May 2016. He led the team to two consecutive league titles, two Ukrainian Cups, the Super Cup and the Champions League last 16 this season.